The field of Emergency Medical Services is one of very high demand because at any given moment, there is always someone in need of medical attention. To further your career as an EMS employee, perhaps a step up from an EMT, you can pursue your associate's degree in emergency medical technician training today. Working as a paramedic takes a lot of additional training and responsibility for patients' lives, for procedures and treatments performed, the equipment, accurate records, reports that are called in via radio, approach in transporting and much more. You will be liable for any and all of your actions concerning the individuals in need of emergency services. You will have to think and act quickly and work under pressure because more often than not, a hospital will not be just down the street. Becoming a paramedic is a serious yet rewarding decision because of all the people you will eventually help. Being properly trained and certified is required but is of course worth all the time because you will be saving lives after all. The courses covered when studying to become a paramedic encompass various subjects and areas of study. Some of the focuses can include pharmacology, trauma emergencies, physiology, geriatric emergencies, scene control, OB/GYN, anatomy, cardiology, pediatric emergencies, pulmonology, ECG interpretation and other medical emergency scenarios in the classroom and roughly 400 hours of actual field training which last for about 6 to 8 months. You will also learn from hospital-based clinical training or hands-on training and practice quite a few ALS procedures which stands for advanced life support. The ALS procedures include setting up intravenous lines, dispensing IV medications, surgical airways, needle decompression oral and nasal intubation, various tube placements, manual defibrillation and external pacing. This is a broad listing of skills instructed. All skills can be different anywhere you go because it all depends on the laws of the state. Once you complete the classroom time, you will be on your way to hospital-based clinical training. Here you will get the opportunity with a hands-on approach to practice your newly learned skills on real patients in a controlled environment. Most curricula include rotations through the ER, Operating Room, OB/GYN, ICU, NICU and sometimes psychiatric hospitals. Field training is next where you will be paired up with a certified paramedic to utilize all the information you've learned toward real life emergencies. This pre-hospital training is very important and can be the most difficult, not to mention that usually a minimum of 400 hours of field training needs to be completed. And finally, after all of the above mentioned have been finished, you must obtain certification through the NREMT (National Registry of Emergency Medical Technicians) by passing a combination of skills-based examinations and a written or computer based assessment. Once you take the certification exam and pass, you can be on your way to your career in the medical emergency industry as a Paramedic. You can work for hospitals, nursing homes, private individuals, corporate healthcare facilities or any place that needs a Paramedic and their services. A paramedic is a great contributor to society because people look to them to help them heal and to rescue them from traumas. You can save lives all while doing something you love as a career. - Must have a high school diploma or GED and a valid driver’s license. 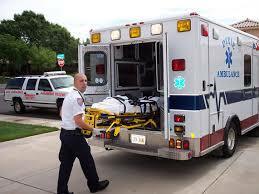 Hours – For an EMT the training hours needed ranges from 125-150 where paramedic training can be up to 1800. Treatments – EMT’s are not allow to provide any treatment to a patient. Basically anything that is given to the patient in the form or medicine or injection can’t be performed by an EMT. An EMT can perform CPR as well as help mobilize a patient. EMT’s are often the first on the scene to assess the situation and offer assistance if possible. Drugs – Paramedics are trained in cardiology and medications. They are allowed to offer and administer different types of medications to patients in case of emergency. Salary – EMT’s are paid approx. $24,000 as an entry level salary to upwards of $43,000. Paramedics make more at $35,000 and the upper 10% make over $57,000. Of course depending on how long you have been on the job and the need for your position can and will affect the amount of salary you make.